My friend Hans put me onto this smashing new German brand called Bellaciao. With their classic, hand-built frames, Bellaciao strides firmly onto the market in style. Here's one of their Corva Citta' models for ladies. The way the top bar curves upwards to meet the rest of the frame is oh so Italian and Bellaciao makes no secret of their romantic love affair with Italian bicycle design and aesthetics. Here's another Corva Citta' for ladies, looking lovely in the sunlight. (I see spring everywhere I look at the moment...) The name Bellaciao is undoubtably inspired by the Italian partisan song popular during the Second World War, which makes us even fonder of them. A friend of our Jason McNiff sings a version of the song which we used on our Cycle Chic Goes to Paris video. And their gentleman's models are also quite smashing. Here's the Corvo Citta' Uomo. Sleek and gorgeous. If there was one parked outside my flat with my name on it, I'd raise the handlebars to sit up a bit straighter (like my mother taught me) but otherwise I'd thoroughly enjoy this sweet ride. Prices start at €649 and Bellaciao is launching this spring. Keep your eyes peeled. 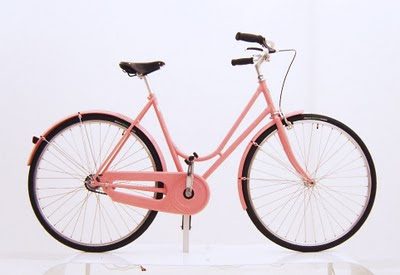 Until then, the bicycles get a nod of approval from Cycle Chic. These single speeds bikes are all very well for those living in flat places, but what about those of us who live in places with hills? When I look out the window I see a hill that higher than the highest point in Denmark (Arthur's Seat 251 m, Møllehøj 171 m), some of us need gears. goodness. how on earth did all those people riding bicycles in your district manage between 1880 and 1950?! in the Danish national anthem there are lyrics about our hills and valleys. so that 'flat' myth is tiring. :) visit Aarhus, our second city. or budapest. or gothenburg. or a host of other ccycling cities. or read Tom Hall's account of cycling in Jutland. The hills surprised him. Use gears if you like, but they are not, by any means, a prerequisite for cycling on exciting topography. Enough whining about the hills thank you. 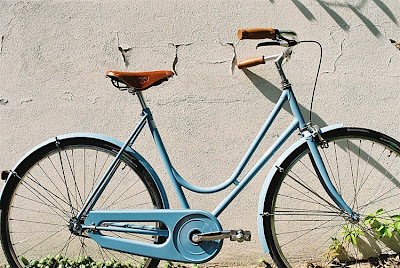 These bikes look very similar to Abici. I own one and it's always a pleasure to ride. I like that pink one. So nice bike. 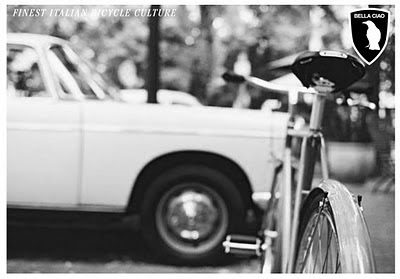 Mikael, those are some really beautiful bicycles, and I really enjoy this Blog. Not trying to cause a fight, but it really bugs me when people refer to bicycle as “Ladies” or “Gents” bicycles. I would think that part of “Demystifying” the bicycle would be to also get rid of the antiquated dogma of a step through frame being just for “Ladies”, and a diamond frame being just for “Gents”. thanks to everyone for the comments. thanks to mikael for writing this piece on BELLA CIAO and for sending our stats counter completely through the roof. and thanks to hans for being so kind to visit us on our stand in Berlin Fahrrad Schau and to obviously appreciate our bikes. thanks hans. and special thanks also to william for his comment. honestly, i feel the same about the 'antiquated dogma' of differentiating between 'ladies' and 'gents' bikes. - still we have named our CORVO CITTA models DONNA and UOMO... for the moment at least. maybe we should really change that weird gender specification in the name next year. in fact matthias of BELLA CIAO mostly rides a step through in berlin. and the ladies... our ladies are hardly ever seen without their INGEGNERE diamond frames. so for the moment - william you are absolutely right - let's encourage everyone to ride everything. according to the time tested and eternal motto "style over speed!" This is a great blog. Thanks for your posts guys. Keep posting. One of my favorite cycling blog!